Off the grid power is true self reliance, enabling you to have free electricity. Here's how. Power companies create electricity through huge generators. That electricity is then shipped through wires across long distances and into individual homes by power poles and wires. Most people who want power contact their local utility company. That company then sends someone out to connect the wires from the electric poles to their home. The problem is, when a squirrel crawls into a converter box, or when there’s an ice storm, or when too many people are using the power at once, you're without power – sometimes for days. Also, if you choose to live in a remote area, it can be hugely expensive to have your home connected to the grid. So some people have chosen to get off the grid power. Generally, there are three basic ways to create your own off the grid power – solar power, wind power and hydro power. A solar charging kit allows you to harvest energy from the sun. Or you can build your own solar powered generator. Leave your garden hose in the sun on a hot day and you'll have free hot water. The sun has power, and there are ways to harness that energy. But generally, in order to harvest this off the grid power from the sun, you will need solar panels either on the roof of your house or near where you live. When these panels are hit with sunlight, semiconductors in the panels collect the energy and knock the electrons loose making them flow freely. An electric field in the panel takes the electrons and forces them to flow in one direction. This creates a direct current and off the grid power. Because the appliances in most homes run on alternating current, the current from the solar panels is passed through an inverter that changes it into alternating current. You can build your own small wind generator that generates 50 watts by using a kit like this one . Collecting the wind is another source of off the grid power. You will need a wind generator - something that looks like the propeller of an airplane that sits on top of a tall tower that's anywhere from fifty to 100 feet tall. The wind blows, making the blades of the turbine move and spin a shaft that runs from the hub of the turbine to the rotor of a generator. The generator spins and creates electricity (again, a direct current). The inverter turns that current into alternating current. If you live near a creek or river, hydropower could be a viable energy option for you. Instead of using wind to turn the props of a propeller, you use water. 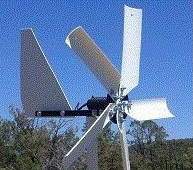 The propeller spins, causing a turbine to move and generate electricity. 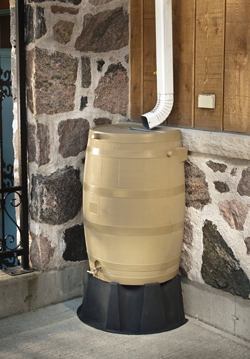 Using a rain barrel cistern like this one is a smart way to have water in an emergency. If you already live in the country, then having your water piped in probably isn't an option. Most folks who live on an acreage have their own well for their water with an electric pump that pumps water out of the ground and into their homes. But a nice alternative that also saves energy is to build a cistern to collect rainwater. A cistern is basically a large tank made of steel, concrete or fiberglass. If your cistern is below ground, then again, the water will have to be pumped out, but if the cistern is above ground, gravity will act as the pressure to get the water into your house. Naturally, if you live near a large city (we're talking pollution here), you don't want to use a cistern for your drinking water. Also if you collect water from your gutters, then you'll want a clay or metal roof rather than a shingled one for cleaner water. 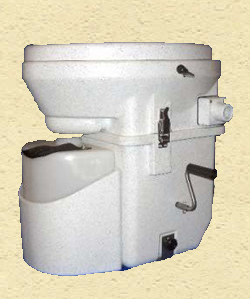 A composting toilet like this one is an excellent choice if you don't have running water or simply want to cut down on water use. But if you're in an area where you get a lot of rain, this is a viable option for collecting water for bathing, laundry, watering your garden and even cooking and drinking – provided you have a filter system for your drinking water. Conventional toilets use between four to six gallons per flush. Considering how many times the average family of four uses the toilet during the day, that's a lot of water going down the drain at a cost to you, not only of water, but also electricity - if you are using a well and an electric pump. The composting toilet not only saves you in water and energy costs, it also adds to your garden by providing you with rich compost. It's not just for a great day at the beach, but the sun can be a great source of off the grid power as well. Learn about harnessing power from the sun. Is it always breezy where you live? You can use all that air to save money. Learn how harnessing the wind is becoming an increasingly viable source of electricity. If you have a small stream nearby, you not only have a source of water, but you could also have a potential source of energy. Learn more here. Want to use that rain on days when it's dry? You can with a rain barrel. Learn why a cistern is great source of back up water for emergency purposes. If you don't have water pumped into your house, you will need an alternative way to deal with waste. Enter the Composting Toilet - How it works and why you should have one. For the hard-core, off the gridder: The Methane Digester and How it Works. Do you have a drilled well and still want to use it, even when you have no power? Then learn more about a deep well hand pump. If you live in the country now, or you are considering country life in the future, you will soon realize you don't always have a reliable source of power for your home. That's why knowing a little bit about generators and owning one is so important. Learn more. So what separates the portable propane generator from other generators? You'll find that a propane generator is less expensive to run than the gasoline version, saving you money. Also propane is a much cleaner fuel that produces fewer toxic fumes, making it safer to use around the home. Read more. Using windmills may not be the easiest way to provide off the grid power for your home, but if you have the right system and are willing to put in the work, you could have an energy source that will last for years and save you thousands of dollars. Learn more. If you live in a sunny area, solar panels could be a great way to get off the grid. Learn more. Wood burning cook stoves are the epitome of self reliance when it comes to heating your home and cooking food. But be aware there is a learning curve to using this appliance from the past. Learn more. Wouldn't it be nice to be able to make ice cream even when the power is out? Fortunately you can! Learn more.